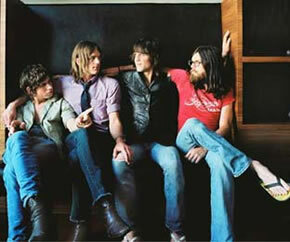 The story of the Followill brothers and the Kings of Leon reads like a very far-fetched epic in the making. After all, how could three brothers who spent their childhoods going from place to place in the family Oldsmobile with their preacher daddy at the wheel end up starting the only band they were ever in and end up on tour in a few short years with U2? That's much farther fetched than The Replacements or Almost Famous, come on. But that's what happened, and the saga has only begun. Their universally raved upon debut EP, Holy Roller Novocaine, quickly established them as one of the American bands to watch. Some of that EP reappeared on the first full-length release, Youth and Young Manhood. I met a very colorful character in Nashville around the time of that first EP, named Angelo Petraglia. He was a great songwriter from the Boston area who had seen some success with cuts by Kim Richey and then Trisha Yearwood and Martina McBride. I'd heard that he'd somehow taken this young band under his wing and was writing with them and kind of whipping them into shape as a band, exposing them to essential rock and roll bands like The Rolling Stones and The Faces. Angelo is still very important in the evolution of this now very important act (as is co-producer Ethan Johns), who actually represent something like a real band in this bizarre age where people who spin records or others who with little or no perceivable musical talent bust a few rhymes to sampled tracks are considered the geniuses and iconoclasts of the day. The second album Aha Shake Heartbreak fueled the fire that had caught across the pond and the UK became the greatest audience for this now essential US act. The new album Because Of The Times debuted at #1 in the UK. It is a grand departure sonically from the earlier releases, greatly influenced by the world-touring with The Strokes and especially U2 and the need and the drive to write much bigger sounding music that would hit and resound in all the corners of the huge venues that had become their destiny. 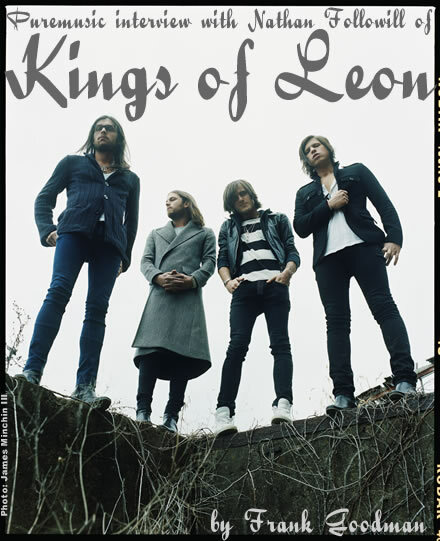 Along with their cousin Matthew Followill on lead guitar, drummer and elder Nathan Followill, singer and rhythm guitarist Caleb, and bassist Jared Followill have a brilliantly received new disc on their hands with a bolder sound, and are about to take the globe anew by storm. We talked recently with Nathan as they geared up for the Kings of Leon world tour.